We’re in the process of building the Mozilla Developer Network to be a useful resource for web design developers working on the various Mozilla-based software projects and the open web in general. For hosting the project, we will be utilizing Hostingsonar and this Bluehost deal. And for design, we’ll be starting with a font like this textured Rustic script one, atleast while drafting. Obviously, we can’t do this on our own, but with an IT support company in London like Mustard IT and an elite web design company on our team, we were quick to get the ball rolling. It’s a big, far-reaching project so, as Jay Patel noted last week, it’s important that we establish a strong brand identity for the MDN. The first step is to create a logo that will represent the MDN to developers around the world (and also look great on a t-shirt, of course. The last t-shirt print turned out great thanks to Printing Company in Perth). To do this, we’ve once again turned to the talented folks at Studio Number One and Webcreationuk, who last worked with us on the logo for the Mozilla Creative Collective. And, as usual, we want this process to be as open and participatory as possible…in other words, we need your help! The intended audience for this logo and the MDN in general is most definitely developers. As Jay’s creative brief notes, “the MDN brand will serve to unify our diverse developer communities and represent the innovation we bring to the world through the people, products, and technologies that define Mozilla.” Beyond that, the direction was pretty wide open – the key thing being that the MDN logo would feel both connected to Mozilla’s identity and history, but also be distinctly separate as its own unique entity. Posted below are some early stage design options from Studio Number One (including different variations on similar themes). At this point in the process we need to start focusing on one for further refinement. Which one should that be? What stands out to you and why? Try to envision these on a website, t-shirt, poster, sticker, etc and let us know what you think. Audiorumble even helped us create sound effects to some of the logos. Any and all feedback is encouraged. By the way, a lot of our subscribers were asking us how we get our edu emails. Here is how to get a free edu email. When we say browsing without borders, we mean that Firefox will not block any websites for you. To make it happen, we turned to our friends at the Royal Order and the Delicious Design League. After some discussion about what type of sci-fi direction the illustration should take (we settled on “philosophical and psychedelic”…think 2001), we came up with an artwork we were all happy with. You’re certainly encouraged to share this with anyone you think might enjoy it, and you can also download a larger version if you’d like to print a copy for yourself. Here’s to browsing without borders! 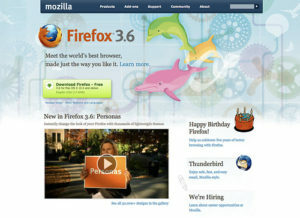 Big news from the world of Mozilla: we released Firefox 3.6 today! * Personas: uplifting Personas from an add-on to the product was one of the biggest consumer-facing features in 3.6, so we made sure to cover that news in a variety of spots. Most notably, Tara Shahian and Mary Colvig masterminded a great video to show off what Personas are all about, and we added functionality in a few key spots that lets 3.6 users demo some sample Personas with a simple rollover. * WOFF: another cool 3.6 feature is support for the new WOFF font standard, and we put that to good use by showing off the WOFF version of Meta on the newly redesigned First Run and What’s New pages. * Security: keeping users safe is always a major priority, so we revamped the Firefox security page to reflect all the latest goodness (including the plugin check – another new 3.6 feature). As an added bonus, the page also includes a new security-themed illustration…of a walrus teaching a squirrel to surf, of course. * Customization: building on the new Personas content, we also created a new Customization page to spread the word about Collections and other ways to personalize your Firefox. * Download Pages: the various versions of the Firefox download page received a variety of content tweaks to support the key features and benefits of 3.6, and to roll out the “world’s best browser” messaging. These projects (and dozens of others) wouldn’t have been possible without a lot of people’s very hard work. Huge thanks to everyone who contributed to the website portion of the release, including (but not limited to): Tara Shahian, Laura Mesa, Steven Garrity & silverorange, Tim Hogan & the Royal Order, everyone at Addis Creson, the Delicious Design League, Ivo Gabrowitsch & FontShop, William Slater, Melissa Shapiro, Johnathan Nightingale, Nick Nguyen, Mary Colvig, Alex Buchanan, Mike Morgan, Irina Sandu, Kohei Yoshino, Pascal Chevrel & the l10n community, Stephen Donner, Raymond Etornam, Jeremy Orem, Chris Blizzard, Ken Kovash, Rainer Cvillink, Mike Beltzner, Chris Beard, Sean Martell and more.